Randy is of Hopi, Navajo, and Shawnee heritage. He is the great grandson of carver Guy Maktima and the son of carver Nick Brokeshoulder and Sharon Brokeshoulder. Randy is currently enrolled full-time at the University of New Mexico. His major is elementary education. After he graduates, he would like to teach Native children. He was the first student selected by the Institute for American Indian Education (IAIE) faculty for a New Mexico Higher Education Teachers Quality Scholarship. On weekends, Randy frequently returns to Hopi for dances or he may be found at a powwow. He has won awards for his drumming and grass dancing. 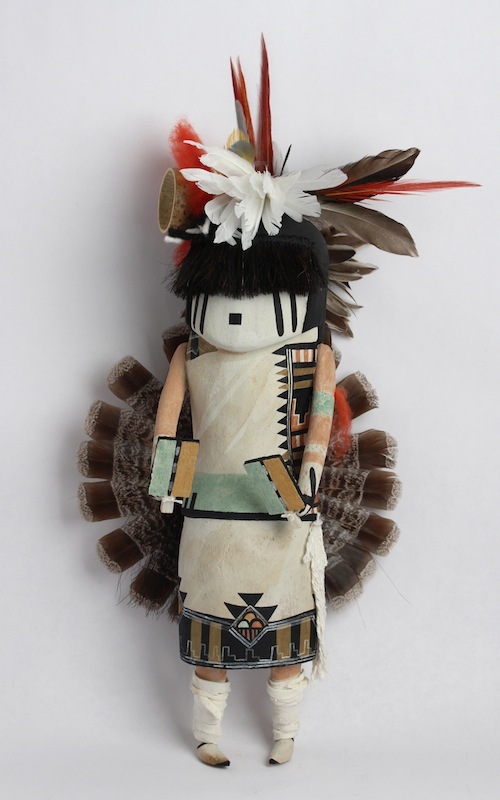 Randy’s dolls are all carved from cottonwood root and painted with natural pigments. They typically exhibit muted hues enhanced by bits of red or black yarn, feathers, and sometimes, horsehair. Randy is the older brother of Brent Brokeshoulder, also a kachina carver.